The Jack Sack™: BREAKING NEWS: 24 SEASON 7 TO PREMIERE SOON! BREAKING NEWS: 24 SEASON 7 TO PREMIERE SOON! Breaking News! EXCELLENT NEWS! 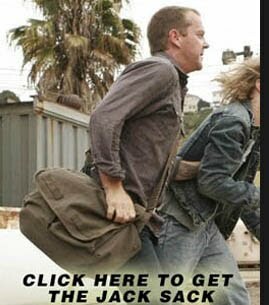 Unconfirmed reports state that the long-delayed Season 7 of "24" is being rushed to premiere sooner than the previously-scheduled January 2009 window. The new premiere will be in Sepember 2008! This is a surprise, for sure, but a welcome one. At this point, I don't care if they give Jack an orangutan sidekick and a plucky new boss with has a silly catchphrase (Oh, Jack, NO YOU DIDN'T!"). All I want is "24" to come back. And maybe a new car. 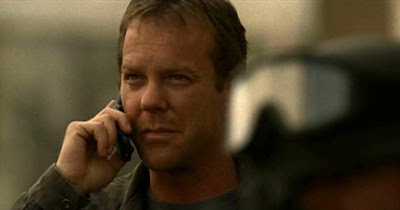 So, if we do the math, today is April 1st, which would put new episodes of 24 are only five months away! Stay tuned for more news on Season 7. Rickey is now even more skeptical. you are so making april fools of us. Well, no 24 until 2009, but at least your post is likeable. SPAM-alot around here? What did I do to deserve this whorish attention? Heh, Rickey's usually the prick spamming blogs hoping to get a few hits here and there. Sure, there are automated servers that do that now, but Rickey likes to maintain that personal touch while telling the folks at the Cat Fancy blog to check out RwR.